Found on my sister's bookshelf, a portrait of my sisters and me inscribed into a copy of The Joan Walsh Anglund Story Book. Published by Random House in 1978. That is amazing! What a precious find! And I loved Joan Walsh Anglund when I was a little girl. I think I wished the world fit into her perfect lines and colors. I love her sketch of the three of you. Okay, that's just beyond cool. I can't believe it either; wow! That's the best book inscription I've ever seen! Holy cow! You are so lucky!! So awesome! That's a real treasure! Wow. I take it this vintage thing and love for children's books has been, quite literally, your passion since you were a little girl! This is very cool :) What a treasure. Wow, you just don't get this thing from around a corner! This is truly something to behold. A book with a signature of the author is something but a book with a sketch of you and your sisters, this is truly a unique item and must be kept dearly! What's cool thing to own! I LOVED Nibble Nibble Little Mousekin as a child , I liked the contrast between the simple featureless Hansel and Gretel and the Wicked Old Witch! Magical stuff! I'm so envious! 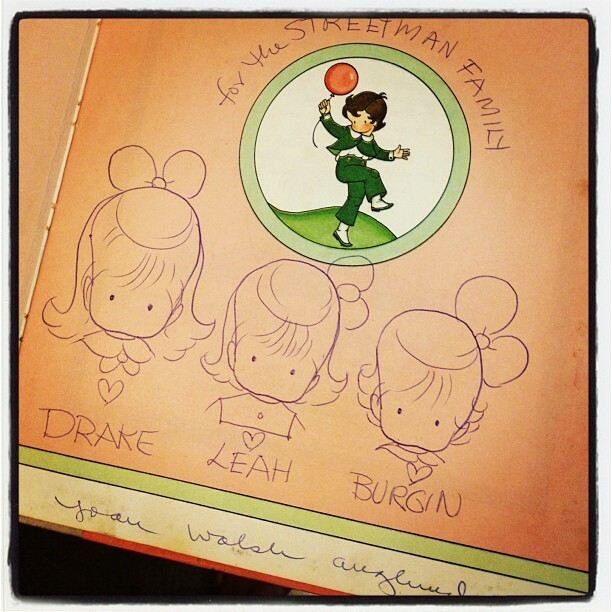 What a treasure, I was such a fan of Joan Walsh Anglund..... her illustration style really influenced my own.